A massive wildfire which killed 42 people in northern Israel has now been extinguished, emergency officials say. The blaze, which broke out in forests close to the city of Haifa on Thursday, had required international firefighters and equipment to stem it. Israel's highest ranking policewoman, Ahuva Tomer, who was caught in the fire on Thursday, has since died of her injuries, her family said. A 14-year-old boy has been identified as the "prime suspect" in the blaze. The police said he admitted to starting the fire accidentally, after he threw some burning coals from the water pipe he had been smoking on Thursday into an open area of the Carmel forest. The teenager said he panicked, fled the scene and returned to school without telling anyone, according to police spokesman Micky Rosenfeld. Interior Minister Eli Yishai, who has faced calls to resign over his handling of the disaster, has ordered a commission of inquiry. Rains fell overnight on Sunday, helping firefighters in their final efforts to contain the blaze. Foreign firefighters were due to leave Israel late on Monday, Prime Minister Benjamin Netanyahu said. 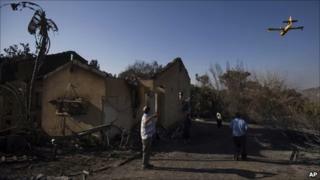 The fire was the worst in Israel's 62-year history, and the government has faced criticism for not being prepared for it. Firefighters ran out of flame-retardant chemicals shortly after the blaze began, and crews did not possess any firefighting planes, reports said. A total of 24 aircraft were flown in from abroad to help, while the Palestinian Authority dispatched three fire engines and crew. Ahuva Tomer, Haifa's deputy police chief, died after being seriously burned when her vehicle was engulfed in flames on Thursday. She had been driving behind a bus of prison guards sent to evacuate 500 inmates from Damon Prison when both vehicles caught fire. Thirty-six trainee prison officers on board died in the incident. The fire also killed three police officers, a fireman and a 16-year-old firefighting volunteer. Officials say the fire has destroyed more than 12,300 acres (5,000 hectares) of land, more than five million trees and 74 buildings. Mr Netanyahu has pledged to rebuild the damaged area quickly, and has approved an initial $16.5m (£10.5m) special emergency aid package. Most of those evacuated during the fire will now be allowed to return home, the fire department said on Sunday night.